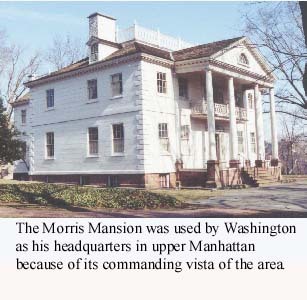 Washington seized the mansion of Roger Morris, a tory, and used it for his headquarters after retreating from lower Manhattan on Sept. 14, 1776. The house had a fine view to the south. Washington rode down from his headquarters to attempt to get his men to fight at the Battle of Kip's Bay. This was also his headquarters during the Battle of Harlem Heights. 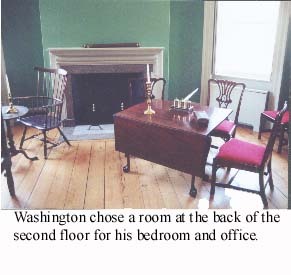 Washington left the mansion in mid-October when he was forced to evacuate most of his army from Manhattan. British landings in the Bronx threatened to isolate the Americans on the island. The Morris house then became the headquarters of British General Sir Henry Clinton, and finally the headquarters of the Hessian commander, Baron Wilhelm von Knyphausen. The Morris Mansion must have had some special meaning to Washington. Twenty years earlier, when he had visited New York for the first time as a young militia colonel, he had fallen in love with the beautiful Polly Philipse. Instead of Washington, she married his friend and fellow soldier Roger Morris. 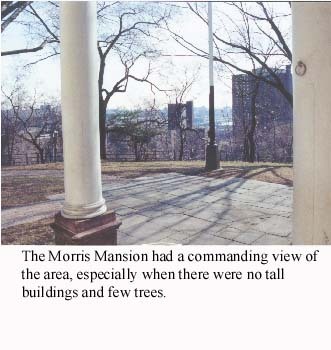 Morris, a loyalist, and his wife fled the New York area as the Revolution began. So it was her home Washington used as his headquarters. During his stay at the house, he wrote to Polly's aunt, saying, "I beg the favor of having my compliments presented to Mrs. Morris." After the war, when Washington was president, he took his Cabinet north of the city for a dinner at his former headquarters. The house was then unoccupied and listed for sale. A local farmer was caring for it. Guests at the dinner included Alexander Hamilton, Thomas Jefferson and John Adams with his wife Abigail. Washington never slept in the bed. That came with the Jumels, a well-connected French family that bought the mansion and imported furniture from France. There is a claim that Napoleon once owned the bed, but he didn't sleep in it here. In a final twist for the mansion, as the Revolutionary leaders were fading from the scene, Aaron Burr late in life married into the Jumel family and briefly became the master of the house. Address: 1765 Jumel Terrace, at 160th Street. Hours: Tuesday to Sunday, 10 a.m. to 4 p.m., call to confirm. 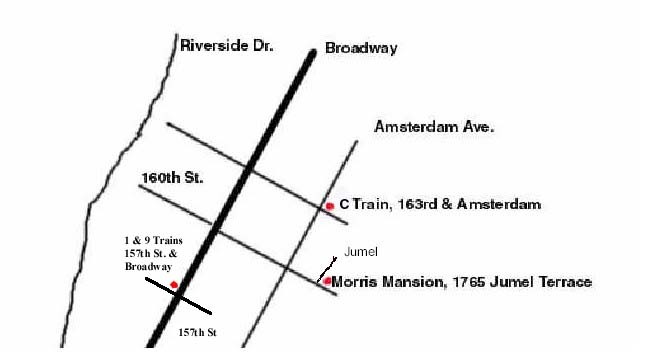 Transportation: Take the C Train to 163rd Street, walk south on Amsterdam to 160th Street, walk east to mansion..